Our laboratory houses the full range of electron microscopy infrastructure: tools for sample preparation, several electron and light microscopes, and hardware and software for computing and visualization. 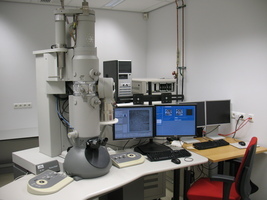 Microscopy - three transmission electron microscopes (TEMs), one scanning electron microscope (SEM), access to two advanced cryo-electron microscopes at the NeCEN facility. Some of our TEMs are equipped with an integrated light microscope for CLEM, HAADF STEM and energy filters for imaging thick samples. Hardware and software for automated 2D and 3D data collection is available. The SEM has an integrated sectioning knife for large 3D volume imaging (Serial Block Face SEM). 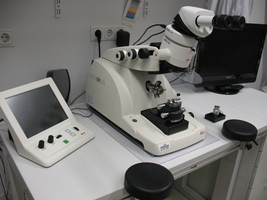 We have two dedicated cryo-light microscopy setups for (super-resolution) cryo-CLEM. Computing and visualization - Our computing infrastructure includes Windows and Linux workstations on which EM related software is implemented. We have dedicated hardware for GPU-based computations. 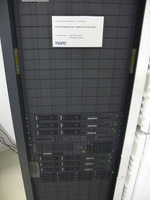 We are connected to the LUMC in-house computing and data storage infrastructure.